Do your team know what they should NEVER do and what they should ALWAYS do for your patients? Once you and your team are clear about the NEVER and ALWAYS with patients, then you can give your patients a memorable and positive experience. When you start thinking about what you NEVER do with patients, you will immediately think about what you AWAYS do instead. This is so easy to do and so worthwhile doing. Knowing your NEVER and ALWAYS means you can make sure everyone on your team is delivering the right experience to your patients. I will share a few of my NEVER and ALWAYS. NEVER Ignore your patient when they arrive at the practice. ALWAYS stand up and beat your patient to the greet. NEVER yawn or sigh in front of your patient. ALWAYS smile and be attentive at all times. NEVER talk with each other in front of the patient, ALWAYS talk with your patients and include them in your conversation. NEVER let your patient walk out of the treatment room without anyone. ALWAYS bring your patient to the front desk with a proper handover. NEVER easily let patients cancel their appointment. ALWAYS find out if there is a solution so the appointment can be kept. NEVER forget to follow up a patient with no appointment. ALWAYS set a time to call your patient to make an appointment. There are so many NEVER and ALWAYS in your practice. These are just a few. Now go and make a list with your team for your patients. Whenever there is a NEVER, there should always be an ALWAYS. 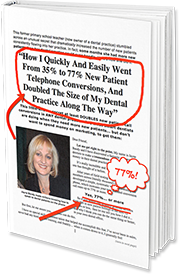 You might have things happening in your Dental Practice that are ALWAYS happening and should NEVER be happening. If this is happening, then now is the time to turn your ALWAYS to NEVER and come up with a better ALWAYS! Come together regularly as a team to look at your NEVER and ALWAYS. Keep updating your list and add new things. This is what Dental Practices who want to make a difference and be the difference, do.